Defence officials' insulting remarks about the public had to be blanked out of government UFO files before they were made public, a memo has revealed. But the once-secret memo, published on its website, reveals "uncomplimentary comments" were edited out. Comments on international relations and defence technology were also deleted. 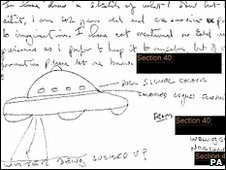 Thousands of pages from the department's UFO files have been released through the National Archives since 2008, revealing details of reported flying objects and encounters with aliens. The newly released memo to ministers and defence chiefs, dated September 2007, discusses how to make the largely "low security classification" information public. It notes they "include references to air defence matters, defence technology, relations with foreign powers and occasional uncomplimentary comments by staff or police officers about members of the public, which will need to be withheld in accordance with FoI principles." The Ministry of Defence (MoD) recorded UFO sightings from the end of the Second World War until it shut its special investigation unit on 1 December last year. Officials feared publishing only part of the information would "fuel accusations of a 'cover-up'," the document reveals. "Contrary to what many members of the public may believe, MoD has no interest in the subject of extraterrestrial life forms visiting the UK, only in ensuring the integrity and security of UK airspace," it says. "The MoD is aware of no clear evidence to prove or disprove the existence of aliens, and consequently the files are considerably less exciting than the 'industry' surrounding the UFO phenomena would like to believe." The fifth instalment of MoD UFO files was released last week, revealing reports of a large triangular UFO hovering in the skies above former home secretary Michael Howard's home near Folkestone, Kent, in March 1997. Was MP Michael Howard buzzed by aliens?